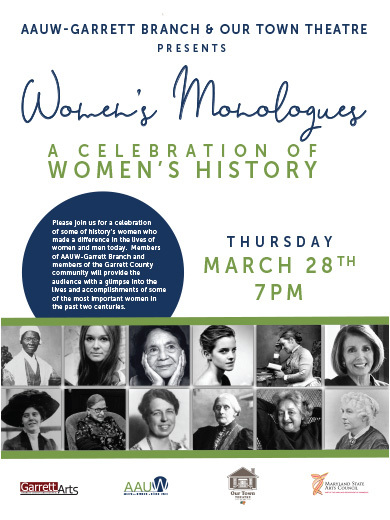 Please join us Thursday, March 28th at 7 p.m. for a celebration of some of history's women who made a difference in the lives of women and men today. Members of AAUW-Garrett Branch and members of the Garrett County Community will provide the audience with a glimpse into the lives and accomplishments of some of the most important women in the past two centuries. The Costume Shop, located on the second floor of The Backstage building at 105 E. Center Street in Oakland, offers costume rentals for all ages and a range of sizes. Options include traditional store-bought costumes as well as vintage clothing. Costume rentals are $5 per complete outfit. Renters are encouraged to bring a photograph of the desired look to assist volunteers in putting together a costume. The shop will be open on Wednesdays from 4:00 p.m. to 6:00 p.m.